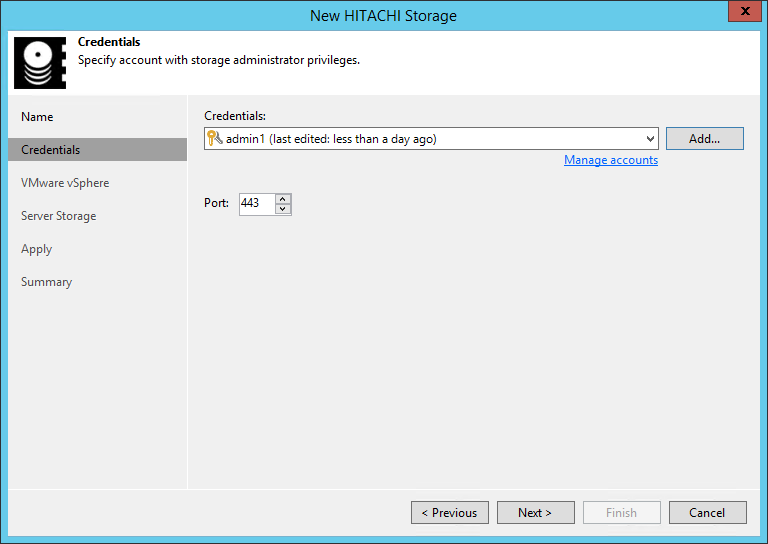 At the Credentials step of the wizard, specify credentials for a user account with administrator privileges on the storage system. From the Credentials list, select credentials to connect to the storage system. If you have not set up credentials beforehand, click the Manage accounts link or click Add on the right of the Credentials field to add the credentials. For more information, see Managing Credentials. User name and password values are case-sensitive. The default port for communication with the storage system is 443. If necessary, you can change the port number in storage system settings and specify the new port number in the Port field.